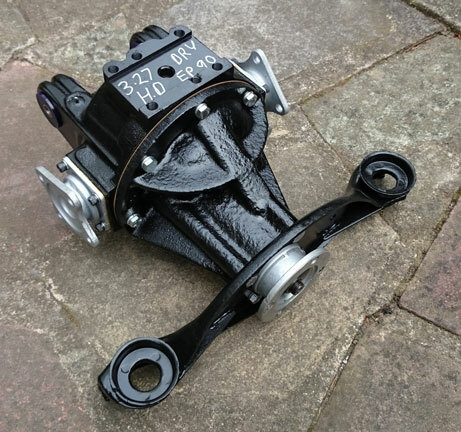 The 3.27:1 ratio differential was originally rebuilt by Tony Lindsey-Dean in November 1982 on a later Spitfire 1500 carrier, which is stronger than the original unit. An all new matched crown wheel and pinion were fitted, using an early (non-swing spring) rear casing and a Spitfire Mk IV nose piece (where the serial number is stamped). Since then, it has done in the region of 20k trouble free miles (it previously broke twice). However in 2015 I asked Mike Papworth to completely strip it, and fit all new Timken pinion, carrier and stub axle bearings, new oil seals and gaskets. He then reclearanced it to factory specifications. and the diff, ready to be installed into the car.